conversations with enthusiasm talking about anything and everything. It is among friends that he appears most alive. When in fact it is to hide a burden of sadness he carries within. opponents movements and reacting in the quickest way possible. Using his elven speed and grace. His skill comes mostly from instinct and intelligence, analyzing everything. Although he likes to use flashy moves. Despite his demeanor when fighting, it is somewhat difficult to provoke Oppstande to fight for himself unless his life is threatened directly. He is more likely to jump to the defense of another more than his own. friends: Oppstande never had many friends when he was growing up, mostly enemies. So he holds on to his friends as much as he can. cleanliness: Oppstande was never a fan of messes, always keeping his personal spaces clean. Large crowds: The population of the human world far outnumbers that of the netherrealm, as a result, Oppstande becomes uncomfortable when among large groups of people. Phobias: Oppstande is afraid of being alone, he always has been. Aspirations: Many people believe fallen angels to be evil beings, Oppstande wants to prove the people of this world wrong and he wants to return home. villages that the people could travel to other towns within few days, but the nearest city was a weeks ride from the village. Which caused it to be mostly self sufficient. Although merchants did come through the town from time to time. And that is where Oppstande was born, when he was, his parents weren't surprised that he contained a spirit, it was common throughout their family, what they were surprised with, was who the spirit was. It was the spirit of Oppstande, the fallen angel of uprising, who became his namesake. Oppstande was trained by his grandmother on how to use his spirit to its full effectiveness. When he became skilled enough, Oppstande started practicing on his own, developing his own techniques and abilities. Description: Oppstande calls upon his spirit to summon his wings. He can use these wings to move quickly over both short and long distances as well as full flight. Description: Oppstande's eyes glow a bright purple. Allowing him to see in the sight of angels. The sight allows him to 'see' whether or not people have the power of spirits and traces of their power. Description: Oppstande creates a single orb of purple darkness the size of his fist, he can direct this orb to travel in any way he wishes up to 30 meters away from his body. The orb itself, deals a small amount of damage, is relatively easy to doge or block, and is not very durable. Oppstande can conjure a maximum of ten orbs at one time. Description: Oppstande creates a semi-transparent curved rectangular wall of purple darkness that is 2 meters tall and 3 meters wide directly in front of him. This skill is entirely defensive and is used to block attacks that Oppstande cannot dodge. The shield can absorb a moderate amount of damage before being destroyed. Description: Oppstande creates a 1 meter long beam of purple darkness which can be wielded as a sword or thrown as a javelin. Attacks with the beam deals a moderate to high amount of damage depending on the strike. The beam can be destroyed with a strong hit. Description: Oppstande points his hand towards his target. Then fires a 2 cm thick and 6 cm long bolt of purple darkness high velocity towards the target (about 20 m/s). The bolt itself deals high amounts of damage but is easily dodged by a moving target or someone aware he is being fired upon. Description: Oppstande extends his hand in a fist and forms a cone of purple darkness around his forearm. The cone is 20 cm long and the base is 10 cm wide. It's use is mostly self explanatory to the name, the drill is used to drill through enemies, shields, and other obstacles. Oppstande can keep the drill going in a single direction as long as he would like until it's 30 meter limit is reached. The cone travels at 15 m/s through the air unless it comes in contact with a physical object. Effect: Oppstande makes a hand motion in the air as if he were drawing a circle with double scythes on it. This sigil is to be used in conjunction with Oppstande's more advanced spells. The diameter of the outer circle is ten centimeters and Oppstande can will the sigil to move anywhere within twenty meters of himself. This sigil can be destroyed. While destroying it will not cancel any spells already created, destroying it will cancel any spells in progress and force Oppstande to make a new one. Effect: First; Oppstande must create his sigil. Upon doing so, he may touch the forehead of any corpse and control it as a puppet until it is destroyed or the battle ends. The puppet's eyes will glow bright purple and a smaller version of the sigil can be seen on it's forehead. The physical capabilities of the puppet are limited though, as the corpse's movements will be somewhat awkward and cumbersome. On the other hand. The puppets do not feel pain, and will have to be decapitated or rendered useless in some way before Oppstande loses a use for it. Oppstande can control up to two puppets at a time. And anything Oppstande controls must be dead. Effect: First; Oppstande must create his sigil. Then, he outstretches his arm. Opening his palm, He directs the sigil to move in an upwards fashion from his thumb, circle facing towards it. As the Sigil moves away from Oppstande's hand, a one handed broadsword begins to appear, coming into this reality from hilt up. The whole motion takes one post and strikes from the sword can be powerful. 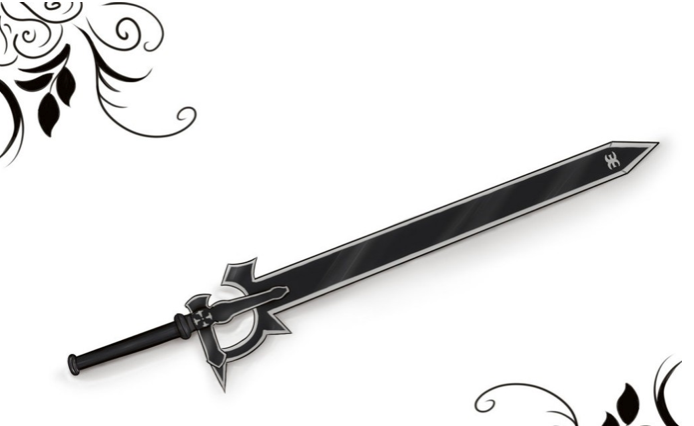 Isn't that Kirito's first sword? Actually it's his last sword from game SAO the Elucidator.